At Nimrod, we realise that every case is different and we can identify and create a comprehensive treatment plan to deal with the problem which is specific to your situation. Our range of guarantees offer ‘peace of mind’ from the day our treatment is done. Our advice and recommendations are based on our survey findings and we offer warranty plans lasting 1, 5 and 10 years. We will produce an initial report, carry out periodic monitoring visits of the site and spray treatments as needed to ensure that the Japanese Knotweed does not grow back. Our 1 year warranty plan comes as standard with all our Japanese Knotweed treatments. A warranty plan that is insurance backed is needed in some circumstances (including to obtain a mortgage where Japanese Knotweed is present on the land) and Nimrod can offer these through Insure Risk via our INNSA membership. 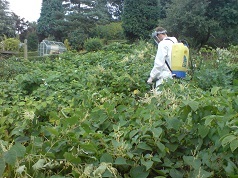 The Invasive Non-Native Specialists Association, INNSA, is the Industry Body for companies involved in controlling and eradicating invasive non-native weed species in the UK. Like our warranty plans explained above, we will produce an initial report, carry out periodic monitoring visits of the site and spray treatments with our services being backed by Insure Risk. A real solution to homebuyers and sellers in relation to mortgages, our warranties are the best guarantee if you have a problem with Japanese Knotweed on your land.